The reports shows which data relevant for MSP should be shared among countries, what gaps exist as well as how the INSPIRE process can support MSP. What data layers are of transnational relevance when developing an MSP (input data) in the Baltic Sea Region? What data layers deriving from the maritime spatial plan should be made available (output data) in the Baltic Sea Region? What are the most common data gaps or challenges with data sharing in the Baltic Sea Region? What is the relation between data sharing for MSP and the INSPIRE process? The EU Directive 2014/89/EU requests Member States to "organise the use of the best available data, and decide how to organise the sharing of information, necessary for maritime spatial plans". At Baltic Sea level, the HELCOM-VASAB MSP Working Group took up this matter in their 2016 guidelines on transboundary consultation, public participation and co-operation. They stipulate that a common understanding and documentation on the availability of data is a pre-requisite for cross-border coherence of maritime spatial plans. To this end, the Maritime Spatial Planning Data Expert Sub-group was created as a sub-group to the HELCOM-VASAB MSP Working Group, which authored the referenced report. The Maritime Spatial Planning Data Expert Sub-group is composed of MSP and data experts from all Baltic Sea Region countries. Furthermore, HELCOM, VASAB and the EU Commission participate in meetings. The terms of reference of the group can be found here. The aim of this piece of work of the Maritime Spatial Planning Data Expert Sub-group is to provide guidance on the availability of data for MSP in the Baltic Sea Region. Two types of data have to be differentiated. Input data are used for the planning process. Input data for the MSP process are normally categorised as environmental (e.g. geology, eutriphication, salinity), sea uses (e.g. shipping lanes, offshore windfarms, cables and pipelines) and socio-economic (e.g. population living in a coastal area, jobs created by maritime sectors) data. Output data derive from the maritime spatial plans. 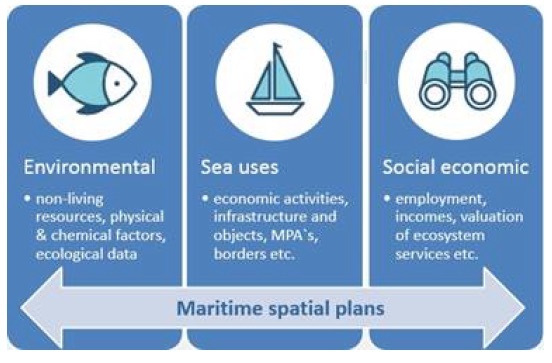 Output data include two sub-types: (i) area of the maritime spatial plan, and (ii) planning zones of sea uses. The report includes three tangible outputs as annexes (see 1)-3)) as well as an assessment of data gaps and challenges (see 4)) and a reflection on the interlinkage of the INSPIRE process and MSP data exchange (see 5)). Focal points as first information providers for national MSP data have been defined. For most Baltic Sea countries, responsible institution for specific data sets were listed in addition. The list of input data specifies which data are relevant for transboundary cooperation and consultation. They focus on sea use data. Environmental and socila data play a lesser role. 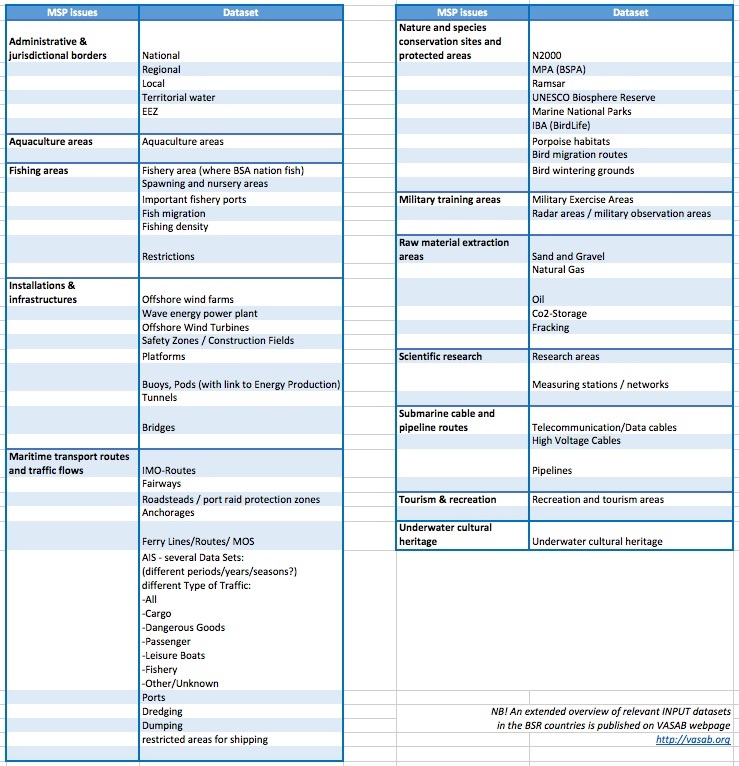 The BSR countries have filled in this table indicating the data holder, the application of fees, the web access and the data format. The sharing of output data should foster cross-border consulation and cooperation in MSP and facilitate the detection of cross-border incoherenes. In a next step, minimum requirments for MSP output data exchange will be specified. Data gaps in the Baltic Sea Region mostly relate to data, which are not structured in databases, as well as to unsatisfactory availability of data for the military, shipping and tourism sector. Challenges are to improve cooperation with science as data provider, limited staff resources in administrations as well as the absence of a harmonised terminology. The INSPIRE (Infrastructure for Spatial Information in the European Community) process which seeks to facilitate data sharing, which is in line with the expectation of the EU MSP Directive to cooperate and share data across borders. The Maritime Spatial Planning Data Expert Sub-group (which is part of the HELCOM-VASAB MSP Working Group) in its report points to shortcomings of INSPIRE in relation to MSP and specifies conditions for the development of a decentralised data sharing system. 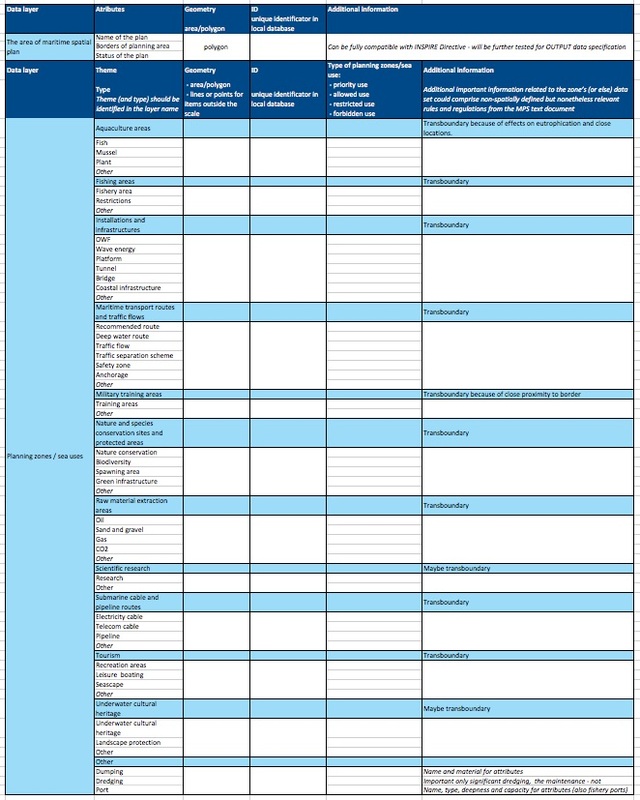 The lists with data layers can serve as a starting point for assessing needs for data exchange in other transnational contexts.